So a few months ago, I was chatting with a friend from university. She asked if I wanted to join her for a road trip across the Maritimes in June. I hadn’t fully thought out my summer, and it seemed like a brilliant idea. Within a few hours Tara-Lee and I began the plans to spend three weeks visiting Nova Scotia, New Brunswick, PEI, Cape Breton and Newfoundland! “Week” one of the East Coast trip, begins with three jam packed days of travel. The start: Halifax, Nova Scotia. We arrived by the oh so wonderful Porter Air in the afternoon, and went to Avis where our silver Chevy Malibu was waiting for us. We made quick friends with our Airbnb host, Chris, originally from Poland, in his charming eclectic art-filled home. A last minute addition to our weekend was a childhood friend of Tara-Lee, Tara. 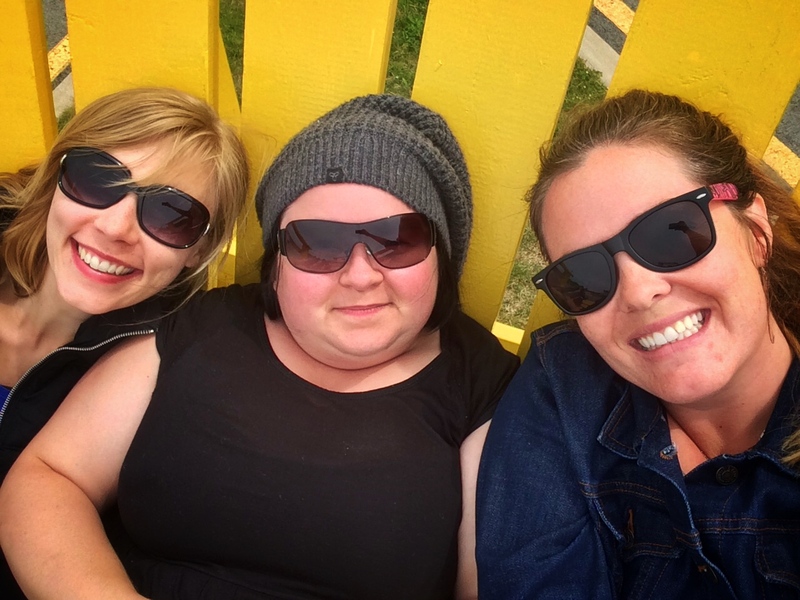 That’s right, folks: this weekend road trip trio (and likely inspires some sort of folk band name, likely), was Sara, Tara, and Tara-Lee. Tara flew in Friday evening, only a few hours after us. Once we were all together, we grabbed a bite to eat at The Old Triangle pub (fish and chips), and did some evening driving around the city, including up the hill to the top of Confederation Park with a night-time city-lights view of downtown Halifax. The next morning we were invited for homemade lattes at Tara’s Airbnb spot and her lovely host Paul gave us insider tips for the start of our journey down to the south shore of Nova Scotia. We then headed right out of town (with a stop at Tim Hortons for our first Maritimes road trip breakfast). Side note, I think there are more Tim Hortons here than anywhere I have ever been. We started by making a slight detour to Prospect, a small hamlet, of quiet homes and docks and some beautiful first glimpses of the coast along Nova Scotia shores. The shoreline had a delightful surprise of multicolored snail shells discarded and swept together, in a pebble rainbow of detailed colours. Our next stop was of course Peggy’s Cove, and it did not disappoint. A windy, blustery, we were warned to avoid the ‘black rocks’ which were where the ocean waves frequented and therefore were slippery and possibly deadly if you lost your footing or a rogue wave came out of nowhere. The lighthouse itself is locked tight but people wander all over the massive shoreline of huge boulders that we could have easily spent hours sitting in or climbing around. But of course, we headed to our third stop of day 1: Lunenburg. Lunenburg is a gem of a town, with the most charming, colourful houses we had seen so far. We stopped into the Distillery to check out their offerings, and from gin to rum to vodka, we all agreed the favourite spirit of the three of us was the rhubarb liqueur! All along the main road, and from our lunch spot “The Salt Shaker” (where we shared scallop linguini , a lobster roll, and salt cod fish cakes), we had an excellent view of the Harbour. Apparently every Wednesday night there are sailboat races! The best view of the city is across the water at the golf course, but photos don’t do it justice. After that it was on to our campsite to set up before we headed to Shelburne for the lobster festival we had found out about online. With four jam-packed days of events this weekend, we decided to prioritize and only attempt to make it to the “Kitchen Party” concert that night. Our campground was at Thomas Raddall Provincial Park. I only briefly checked out the beach nearby in the morning before we took off for our busy day two, and looking back on the weekend, it was the sandiest shore we came across and with the most beautiful weather. A solid reminder of the importance of taking a pause when you come across something you assume you will find again. We arrived in Barrington later that evening; a small town just past Shelburne, where the ‘community centre’ kitchen party was to take place. We arrived at a hockey arena-sized building, and about twelve cars….. Not the best outlook. We went inside where the total of bar staff, security guards, and band members almost outweighed the attendees, and the band was like a basic wedding cover band, blaring almost deafening music we couldn’t dance to, and with no acoustic instruments in sight. We were expecting a pub type setting with guitar, maybe fiddle, even accordion or banjo, but alas, were disappointed. We will have to continue our search for a good kitchen party. On sunday we did get to a community hall lobster roll and chowder lunch and homemade dessert with a local silent auction and games of washer toss outside. We enjoyed the view by the little Sandy Point lighthouse and went on our way. We have had slightly rainy and mostly cloudy weather as we drive along the south and west shores of Nova Scotia, and even though the ocean is never more than a couple kilometres away from the highway we drive, there is a feeling of home as we drive through a mix of poplar and birch and fir trees, on winding roads that make us feel like any moment the fog will clear and we will see the peaks of the Rocky Mountains in front of us. Smuggler’s Cove was a cool discovery along our route. Tough to walk this shoreline in flip flops! We stayed near Digby to make sure we tried ‘world famous scallops’ straight from the source, and ended up at Ed’s Takeout, for fried scallops and clams that were absolutely mouth-watering delicious! It’s a funny little spot that is definitely a simple ‘dive’; definitely a busy place for good reason. 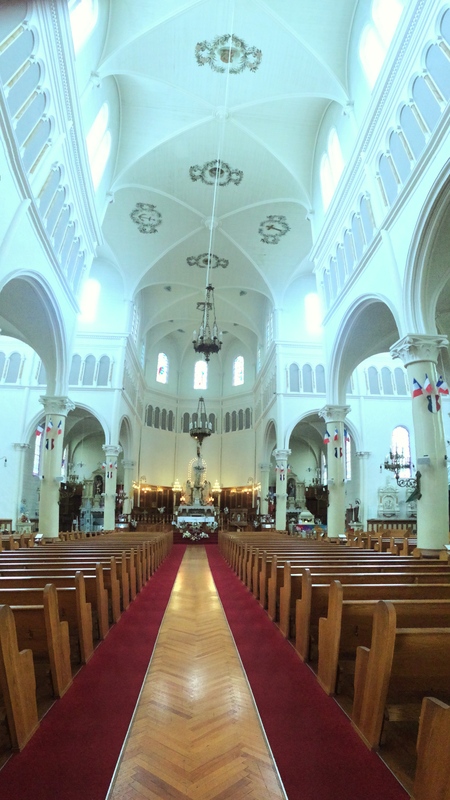 We stopped into a couple of grand churches along the Acadian Trail, and spent a few moments inside. So massive. And peaceful. We have found that all campgrounds so far have had showers, and often: laundry facilities, and even wifi. It’s amazing. I think we will be happy to camp more than we even anticipated! One final day before heading back toward Halifax to drop off Tara at the airport, we were torn on where to stop, as Cape Split, Wolfville, and Truro were all on our list of places to go. After seeing the Cape Forchu lighthouse the day before (and the comically large Adirondack chair upon which we climbed and snapped a photo), we went driving down the peninsula of Digby Neck with hopes of seeing a lighthouse, but discovered that it, along with hikes and whale watching adventures required a ferry ride to the islands across from it, and more time than we had. Annapolis Royal offered their Historic Garden that we all agreed was worth every penny of the entrance fee, and offered a lovely walk through arbours and mazes and winding pathways through various styles and varieties of flowers, trees, and gardens. 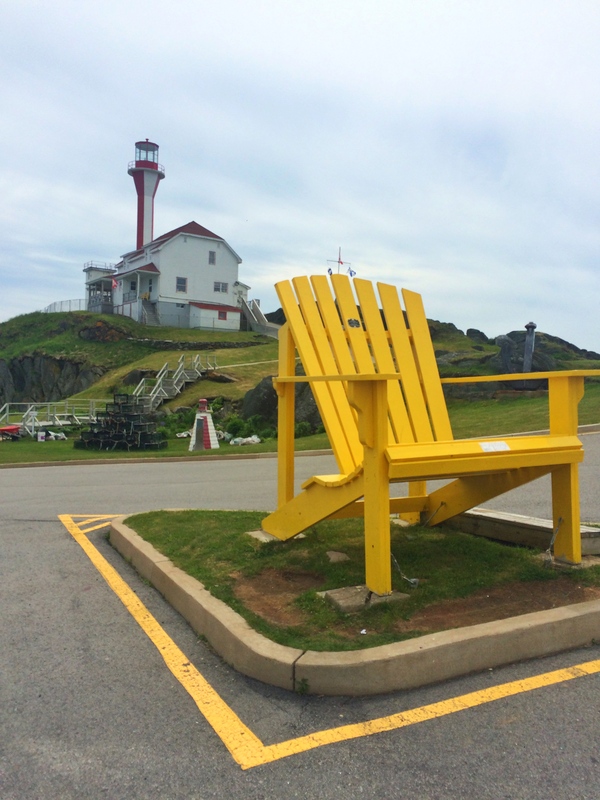 We could have easily spent another couple of hours here, whether taking another walk around the Acadian Dyke lands, or sitting in their cafe, or just enjoying the smell of the lilac bushes and rose shrubs. We were definitely there in the ‘spring’ of their season, as many beds were freshly planted and the rose gardens were only just starting to bloom. 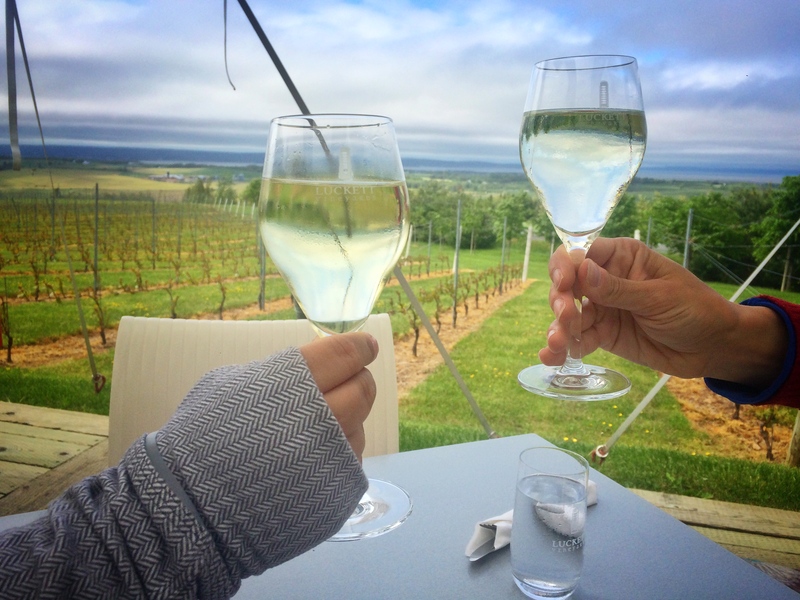 We decided to spend our last 90 minutes before the airport drive at Luckett’s Vineyard for wine and lunch, and it was dreamy. There’s a phone booth in the middle of the vineyard that makes phone calls worldwide for free but we didn’t call anyone. We were content with the view of rolling hills, farms, vineyards, and the ocean as the clouds rolled by. If we could pause time, this would have been one of those moments we would have. After the most hilarious sight of Tara climbing on top of her suitcase to get in her new yoga mat, sleeping bag, and souvenirs, we bade farewell to her and headed towards New Brunswick for the next leg of our road trip. More to come!! ← Bahamas 2016; New Providence Revisited! Thank you, Sara, a thousand years ago, when I was youngish, we ate lobster and lemon pie at Cocagne beach. No choice menu. Loved the Maritimes and the down east folk then. Great accent: try ‘ father ‘ . Til.